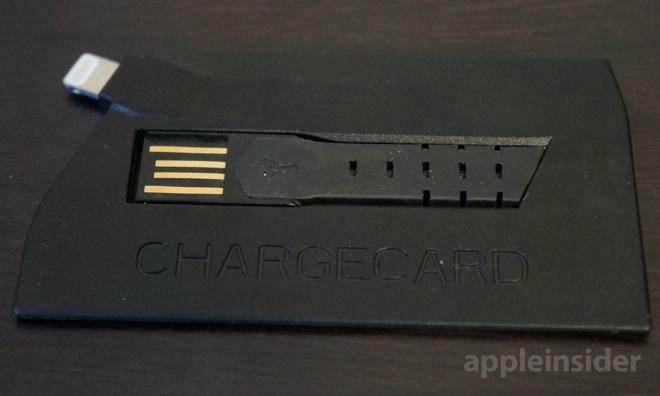 The ChargeCard USB-to-Lightning accessory has seen a slight redesign with subtle improvements intended to make it more durable and easier to use. Here's a first look and quick overview of the brand new ChargeCard from Nomad, as well as a glimpse at the company's upcoming ChargeKey. 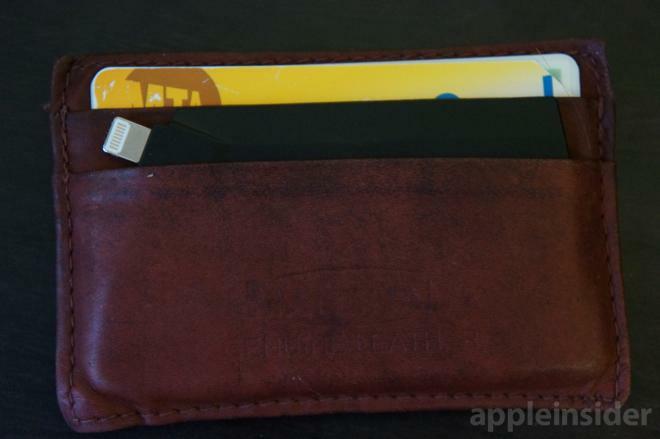 AppleInsider reviewed the first $25 Lightning ChargeCard earlier this year and found it to be an easy-to-recommend accessory. 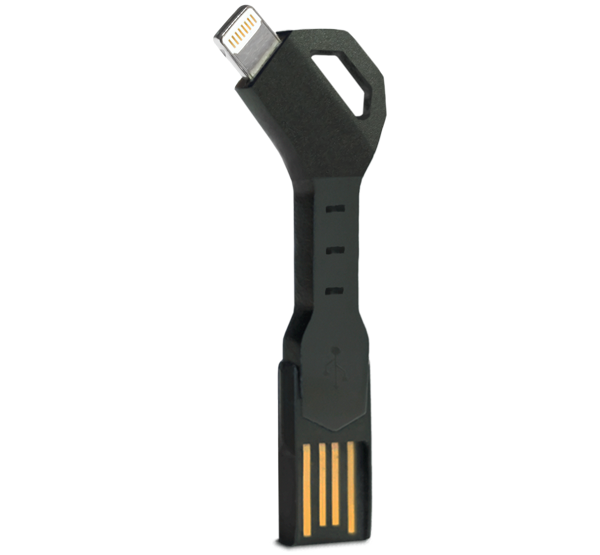 The product is a flat, credit-card-sized USB "cable" that can be easily carried in a wallet, ensuring you always have a Lightning connector to charge your iPhone 5, iPhone 5c, or iPhone 5s. Nomad has now provided AppleInsider with the next-generation ChargeCard, which offers the same functionality, but with a number of tweaks. Most notably, the new card is slightly thinner and smaller with tapered edges that the creator says results in a more durable and easier to manufacture design. The basic design remains the same: A USB connector is housed in the middle of the hard plastic case where it is kept protected, and users can pop it out to plug it in. The USB plug is attached to a bendable rubber strip, which allows the accessory to be plugged into a computer's USB port, or any other USB-based charging device. The USB plug has been improved in the new design, with guiding rails located on each side of the connector. This helps make it clear to users which direction the "cable" should be plugged in. The previous, flat design could be inserted in either direction, though only one would work. Out of one corner of the ChargeCard sticks the Lightning connector, which, in our testing, works as expected with an iPhone 5s. One added bonus: With the new model, iOS 7 no longer gives a warning that the accessory is not certified. 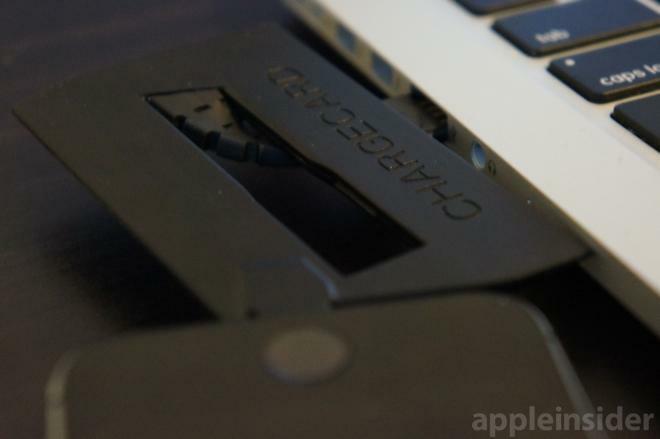 The creator of the ChargeCard also said the new design fixes a sometimes "fickle" connection that could sometimes occur with the first-generation model. The ChargeCard is still an easy accessory to recommend for new buyers. It works as advertised, the new design features slight improvements, and at $25, it's reasonably priced. The ChargeCard for iPhone 5, iPhone 5c and iPhone 5s can be purchased direct from Nomad, and is also available from AppleInsider partner BiteMyApple.co. Nomad is also at work on its next accessory, the ChargeKey, which is a USB-to-Lightning charging cable that can be housed on a keychain, and is about the size of a house key. Backers on Indiegogo can obtain a ChargeKey for a discounted price of $20, while general orders at the full $25 price are available through Nomad. The ChargeKey is scheduled to ship on Nov. 30, with an initial production run of 10,000.